As the World commemorates Interfaith harmony Week, a spirited Muslim woman on Tuesday donated dozens of plastic chairs to Church while a Pastor also decorated mosque structure elsewhere to boost inter religious peace and harmony in Kaduna state. A Peace Ambassador of Northern Nigeria extraction, Hajiya Ramatu Tijjani at a function in Kaduna said the World international Interfaith Harmony was meant to donate importance gifts, dialogue in various ways on the need for spreading peace messages, share love, unity, visiting one another at places of worship and encouraging togetherness irrespective of different faith organization. The World Interfaith Harmony Week which is usually marked between 1st and 7th February every year extends the two Commandments by adding ‘Love of God, and Love of the Neighbour’. This formula includes people of goodwill, those of other faiths and atheists. According to her, this is part of the efforts of strengthening inter- and intra-religious relationship and various strategies that is aim at preventing, countering violent extremism, conflict prevention, peace building, reconciliation and conflict transformation. She said, “the week celebrates the principles of tolerance and respect for one another that are deeply rooted in the world’s major religions. That was why United Nations declare and dedicate first week of this month to promote all activities that encourage and enhance religious activities worldwide. “Last year, I shared 50 Hausa translated Bibles to the church of Christ Evangelical Intercessory Fellowship Ministry Sabon Tasha, kaduna South in order to create more awareness that we are all from One God and we worshipped one God. Adam and Eve were our original parents, we all believed in Bible and Qur’an pointing out clearly that religions preaches, peace, harmony, forgiveness and tolerance and also calls for the promotion of interreligious Harmony”. She then called om government, non-governmental Organizations, civil societies organizations, Human Right, tradional Rulers, youth organizations and community organizations to render support during the week through the spread of interfaith harmony and good will in the world’s Churches, Mosques, Synagogues,Temples and other places of worship on the need for peaceful coexistence. 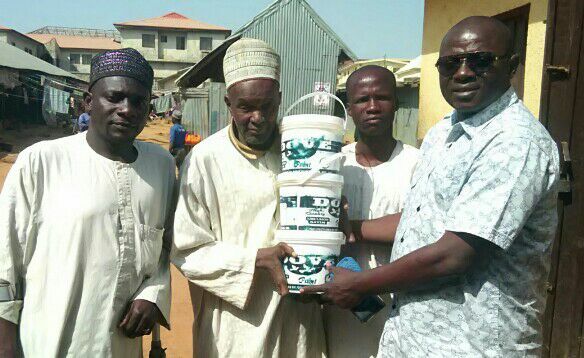 Receiving the plastic chairs, the general overseer of the Church, Pastor Yohanna Buru and pastor Titus expressed satisfaction with the donation and appealed to Christians and Moslems to learn how to tolerate, accommodate and live in peace with one another in order to make the country great and peaceful. As the World commemorates Interfaith harmony Week, a sporited Muslim woman on Tuesday donated dozens of plastic chairs to Church while Pastor also decorated mosque structure elsewhere to boost inter religious peace and harmony in Kaduna state. A Peace Ambassador of Northern Nigeria extraction, Hajiya Ramatu Tijjani at a function in Kaduna said the World international Interfaith Harmony was meant to donate importance gifts, dialoging in various ways on spreading peace messages, share love, unity, visiting one another at places of worship and encouraging togetherness irrespective of different faith organization. According o her, this is part of the efforts of strengthening inter- and intra-religious relationship and various strategies that is aim at preventing./countering violent extremism, promoting conflict prevention, peace building, reconciliation and conflict transformation.